1883 saw Sir Thomas Graham Jackson appointed to design a structure at Brighton College that would become the school’s most recognisable element. Facing Eastern Road, Jackson’s huge red-brick edifice is what greets visitors and the public. But a lack of funds led to the omission of a key element of Jackson’s design. The Cairns Tower opened in December to complete what was started by Jackson 130 years ago. It takes its name from the school’s current Head. A stubby gatehouse, consisting of a pair of arched entranceways with the Head Master’s office above, has been doubled in height to become a glorious tower. Two floors, including an entertaining space and huge office, have been added. A cupola at the top can now be seen from far into the distance (and is particularly attractive from Whitehwak Hill at sunset). 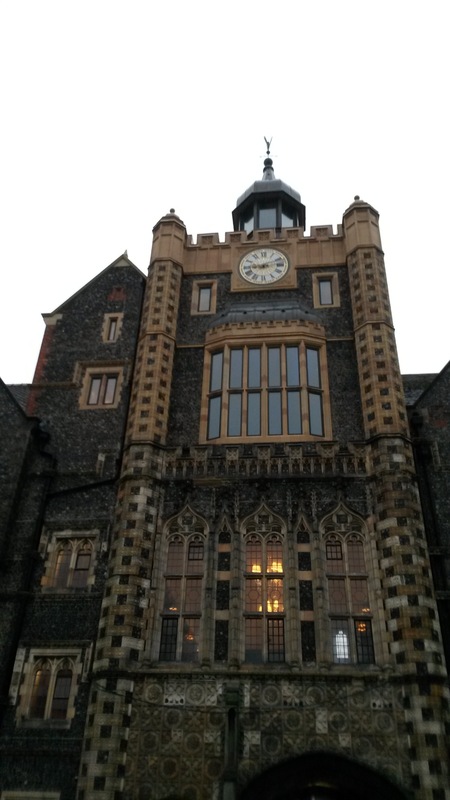 An original design by Sir Thomas, a former Brighton College student who designed a number of Oxford colleges, provided inspiration for the tower, but Richard Griffiths Architects were employed to reinterpret the scheme. The results are incredible. As per the rest of the building around it, brick has been used on the tower’s southern elevation and flint on the northern. There are terracotta dressings throughout. Its windows are bronze, its cupola is lead, and its pelican weathervane is copper. Such work is not cheap and justifying it is an interesting exercise. My view is that architecture has meaning. The tower isn’t about two new rooms. There is a strong message behind it, waiting to be interpreted by anybody who cares to think. To me. it is about finishing what you set out to achieve, however much time it takes. With time in mind, the newly-commissioned clock by Smith of Derby is a fascinating subject in itself and worthy of a future column. Nature is key to the attractiveness to visitors of Dungeness in Kent. The peninsula does hold the designations of NNR, SPA, SAC and SSSI after all. The power stations – one in operation, the other defunct – are of interest to many as well, as are the lighthouses and miniature railway. 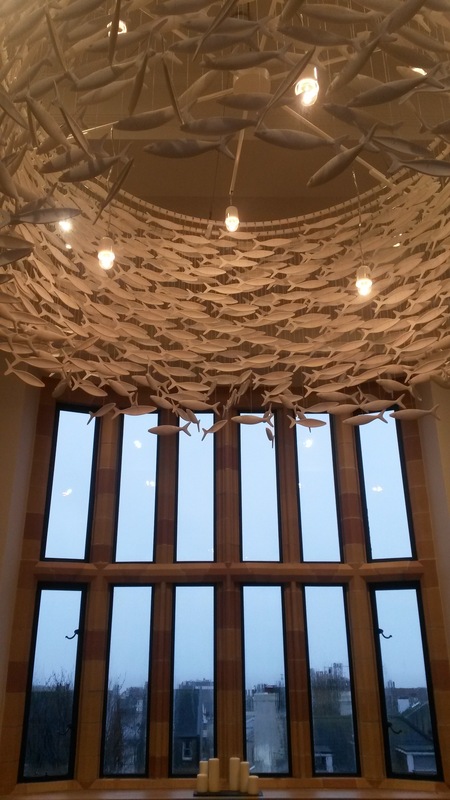 I went principally for the architecture. As Britain’s only desert (according to the Met Office), Dungeness really is a fascinating place. It is characterised by an expanse of shingle, a scattering of windswept plants and a peppering of low detached buildings. It does have similarities with Shoreham Beach which also features plants such as rock samphire and sea kale. More interestingly, railway carriage homes were once common on Shoreham Beach and still are at Dungeness. The most famous home at Dungeness is perhaps Prospect Cottage, a traditional tarred fisherman’s house, which belonged to the late film director and gay rights activist Derek Jarman. Its shingle garden is of national importance. As a beekeeper myself, I was wondering what the short-haired bumblebee (Bombus subterraneus) makes of it following its reintroduction to Dungeness after extinction in this country. 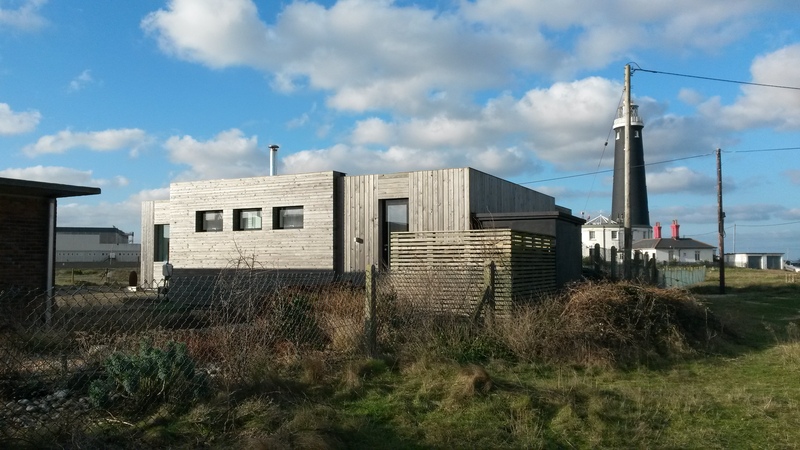 There are around one hundred homes at Dungeness and the rules governing change are strict. New buildings suit the landscape perfectly and offer a refreshing change to the white-rendered rubbish that is springing up indiscriminately across Brighton & Hove. The Pobble House by architect Guy Holloway is a curiosity and features weathered larch alongside corten steel mesh. 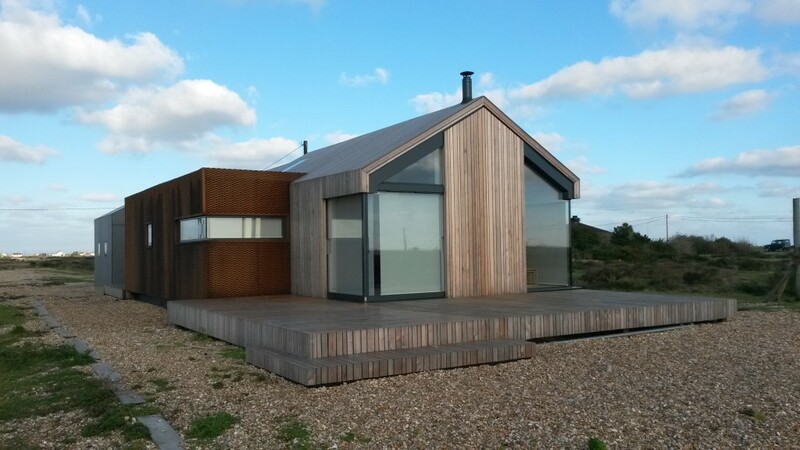 The Black Rubber House by Simon Conder Associates is a rebuilt fisherman’s cottage with larch plywood and rubber (a modern take on tar). The Shingle House by NORD appears a row of tarred gabled sheds – and is actually tarred this time. Many of the houses are rentable holiday homes which makes the prospect of visiting even more attractive. Love it or hate it, the i360 project promises to be one of the biggest engineering spectacles that we have seen in Brighton & Hove for years, and the build promises to be fascinating throughout. I will be covering the project as it progresses, and am particularly looking forward to seeing how Brighton’s main sewer (perhaps the greatest of all local engineering feats) is diverted in January. This week’s news is the release of photographs of the principal components of the tower – 33 giant flanges and 17 steel cans. 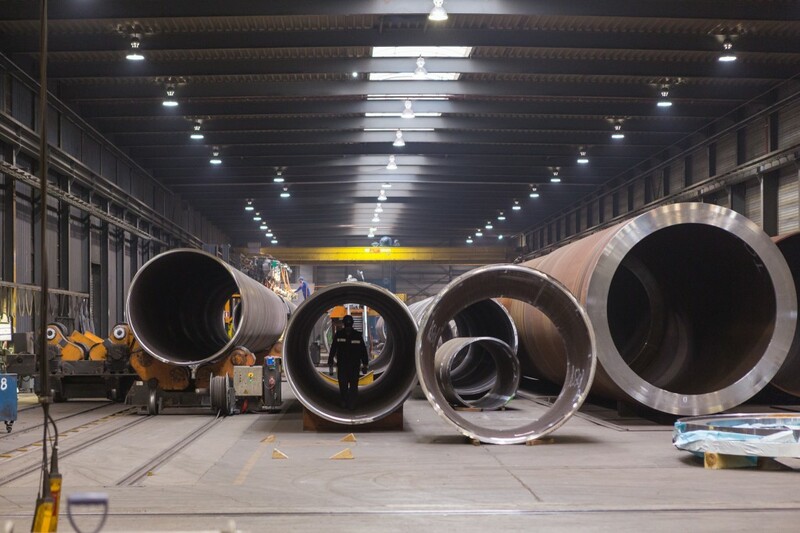 Euskal Forging, based between Bilbao and Pamplona in north-east Spain, has forged the 33 giant flanges that will be used as connecting pieces for each of the 17 steel cans that will become the tower itself. The flanges are machined to make a flat surface and then bolted inside each end of the steel cans. Accordingly, there are two flanges per can (except on the uppermost can where there is one). Each flange is forged from a single ingot of steel. 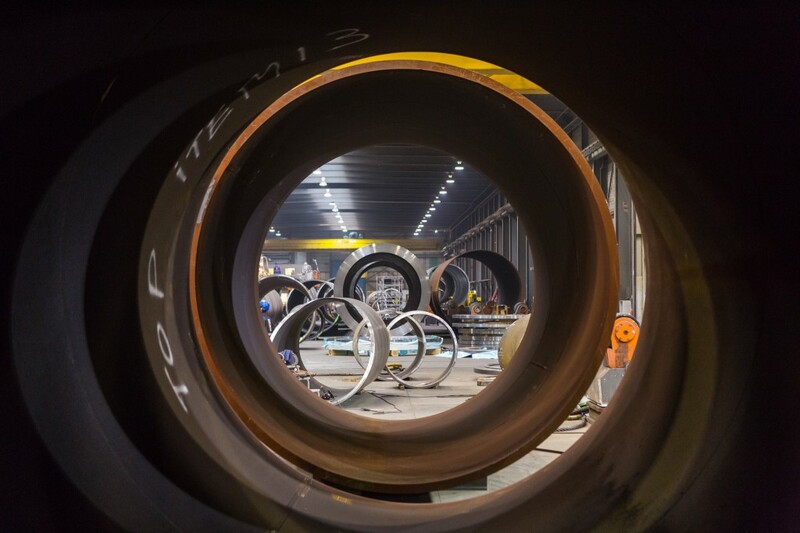 The flanges were approved in early December by steel specialists Hollandia and are now to be transported to Sif Group in Roermond in the south-eastern Netherlands, where the steel cans will be bolted to them. The steel cans will be finished inside and out at Hollandia’s factory in Rotterdam, where they will also be sprayed with molten zinc and painted before being delivered to the UK by boat in 2015. As it goes, I have supported the i360 project since discussions began in 2006. If the figures are correct, it will bring tourism and regeneration to a whole part of town that has been forgotten for years – and joy to hundreds of thousands of visitors who will get to see Brighton, Hove and its surroundings in a most exhilarating manner.